Heyo. Right now I'm working on an update for the US Army Pack and an expansion pack for the USMC. Both have improved models as well as a new gun style. I made this visualization of what I hope Unturned MilitaryRP can feel like when using the new mods. While I can’t exactly tilt the camera, I hope to get into customizing new things that I never had. The Nordic Armory 2.0 has inspired me to take my mod making to the next level. In the new mods, I hope to improve on all areas - texturing, hitboxes, models, performance, consistency. I’m also going to try something new, and use custom sounds, reticules and animations. The animations wont just be for reloading, inspecting and equipping, no. Depending on the weapon and how I plan for it to be used in my server, I’ll also give it a custom way for it to be held as well as reloaded. In the picture below, the camera is rotated as the soldier leans his head in, but this isn’t possible for me to do in Unturned. 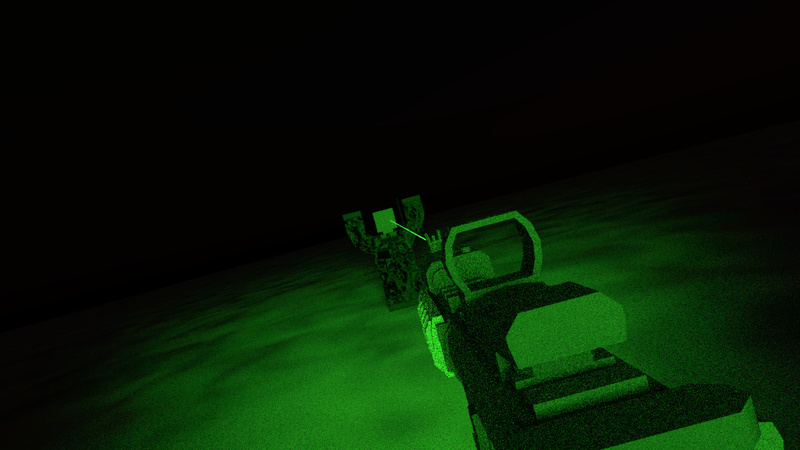 So instead, I’ll move guns closer to the center of the screen, and keep some rotated at about 15-30 degrees. I’ll also email SDG (so Nelson) and ask if there could be an option added to change the laser effect. Nice mod, but you really don’t have to triple post. Maybe they do that in the Steam discussions or so, but we don’t do that here. Understood. But I should make it clear to you that if anything it was simply a double post. The one in Modding isnt actually the same topic. But yes I’ll try not to make that mistake again, thank you for letting me know. Yes thats just the recent style I’ve been experimenting with. I like it, so now I’ll apply it to other items. AND Mk18 (One of my 10 favorite guns) AND tacticool weapon rotation? Also,are you going to release clothing/equipment too,or just firearms?